Yemen, a country located in the South of Saudi Arabia is increasingly making headlines these days both regionally and internationally. Conflicts, uprisings, drone attacks (which began in the country in 2002) and disturbances, none of which are unknown to the residents of Yemen, as the country, have been a magnet for trouble pretty much since the 1960s. The current unrest in Yemen can be traced to the 1962 uprising when the British with the help of its Middle Eastern allies carried out covert activities in the country and used it as a battle ground. The country was divided into two fronts then: North and South. Ever since, the country has continuously faced turbulence and has been a soft target for other entities. Al Qaeda, Islamic State (formerly known as the Islamic State of Iraq and Syria), “terrorist hub” are some of the names which are now associated with Yemen. Lately, it’s the Houthi Shia rebels who have brought the country to limelight. Historically, Houthis are Zaidi Shias. They constitute about 30 percent of the population, were once best known as a movement who preached peace, are now being labelled as trouble mongers but this latest uprising or tide in their movement did not happen overnight. The first time, Houthis came face-to-face with the Yemini government was in 2004 when the founder of the Houthis, Hussein Bader Addian was arrested and later killed. It was then when the movement turned to arms. The Houthis movement started conducting protests based on grounds of self-defence with the then Yemen’s President Ali Abdullah Saleh viewing them as a threat to his rule. The Houthis have been gathering momentum pretty much since last August after the country cut down on the fuel subsidy by declaring it an economic strangulation. It was then that thousands of Houthi protesters marched towards the Yemini capital Sanaa and demanded the government under President Abd Rabbuh Mansur Hadi to resign. The call which was given by the Houthi leader Abdulmalek al-Houthi also demanded granting them with political rights and reforms. The Houthi protestors were then called for dialogue by the Yemini government and a UN brokered deal was ultimately agreed upon by the two sides. The agreement did not last and Hadi was declared as illegitimate by the Houthi rebels after they moved to the capital on 21st September, 2014. The Houthi rebels stormed into the Presidential palace and placed Hadi, Yemen’s Prime Minister and two other ministers under house arrest. However, President Hadi was able to escape. He flew to Aden on 21st February and declared himself as the rightful President of Yemen. On the other hand, violence and anarchy continued to rock Yemen when finally its Northern neighbour felt the need to intervene to save itself from the flames igniting from Yemen and Saudi Arabia formally began airstrikes against the Houthi Shia rebels. Sharing a border of 1,800 (1,100 miles) Kilometres with Yemen, Saudi Arabia is gravely concerned about the situation in its volatile backyard. Before initiating air strikes under its own-led coalition on Yemen, last year Saudi Arabia started building a giant border fence to seal its border with Yemen. The action obviously did not reap the desired results and about a month after ousting the Saudi backed Yemini President Hadi, Saudi Arabia initiated airstrikes in Yemen. A 10-nation Saudi led coalition is currently carrying out attacks in Yemen. After initiation of airstrikes, an Arab League meeting was immediately called upon to discuss the issue of Yemen in Sharam-ul-Sheikh. The 22 nations representing the Arab League called for creation of a joint Arab military force whose Chief Nabil al-Arabi said the Saudi-led offensive would “continue until the militia withdraws and surrenders its weapons”. Saudi Arabia is currently calling for international support against the Houthi rebels and has blamed Iran for creating confusion and destabilisation by supporting the Houthis. Abd Rabbuh Mansur Hadi has gone one step further and has referred to the Houthis as “puppets of Iran” thereby alleging Iran of directly supporting them. Currently, Saudi Arabia is engaged on multiple fronts i.e. internal and external. Saudi Arabia recently experienced a power transition with King Salman bin Abdul Aziz coming to power after the recently deceased King Abdullah bin Abdul Aziz. Firstly, the Kingdom feels a direct threat emanating from the Islamic State (formerly known as the Islamic State of Iraq and Syria) which has emerged as perhaps the biggest threat to the Middle-East and Saudi Arabia. Secondly, the recently concluded nuclear deal between Iran and the P5+1 led by the United States has added to the threats perceived by the Kingdom. Finally, the prevailing turbulence over its border with Yemen caused by the Houthi rebels, is a cause of grave concern. Saudi Arabia is a heavy-weight and like other heavy-weights, the countries under its influence acting out on their own. The current Saudi regime feels it is being cornered and to get back into control, it has to tackle with the Yemini situation with an iron hand and complete success. It needs to be understood that Saudi Arabia will not leave any stone unturned unless it emerges from this situation with the upper-hand, no matter the cost. Iran is once again amid controversy and this time it is not only about its impending nuclear deal. Iran is being accused by the Arabs especially Saudi Arabia of providing support to the Houthi Shias. Even through Iran has called for political talks between all parties on Yemen issue, it cannot save itself from the allegations of igniting the flames of war in the country. Iran and Saudi Arabia have more than often found themselves on opposite side of the page. Iran, which takes great pride in its Iranian nationalism and Shia history has historically refused to bow down to Saudi Arabia’s lead, dictation and its place in the Muslim world. Though the two have never directly engaged in a conflict but they have been found fighting against each other via proxies. Over the years, their battle grounds have altered but the fight for dominance, regional or otherwise, has not. The case of Yemen is no different. Houthis who share a Shia bond with Iran, it seems are being supported by it. The motivation or goal for supporting the Houthis can be debated upon but it seems Iran is bent upon extending its sphere of influence to Saudi Arabia’s backyard. Adding to this mix is the geo-politics of sea. The Bab el-Mandeb Strait is a chokepoint between the Horn of Africa and the Middle East, and it is a strategic link between the Mediterranean Sea and the Indian Ocean. It connects the Gulf of Aden and Arabian Sea with the Red Sea and is located between Yemen, Djibouti and Eritrea. In 2013, an estimated 3.8 million bbl/d of crude oil and refined petroleum products flowed through this waterway. This politics of sea is a driving factor that cannot be overlooked while considering the raison d’etre of the current conflagration. Saudi Arabia sees Iran’s influence in Yemen as a way to spread its wings in its backyard, in the Gulf of Aden. This conflict needs to be seen in this geo-strategic backdrop. The prevailing situation in Yemen is an outright play of realpolitik, narrowing it down to sectarianism will perhaps be, over simplifying it. It is a fight for dominance and interest. As in this conflict, one of the parties involved is Saudi Arabia, a lot of attention has been focused on Pakistan’s decision and role in the Yemen conflict. To put it simply, Pakistan is in a conundrum with regard to the situation in Yemen. The country shares a deep historical bond with Saudi Arabia and any decision to join or not join the Saudi-led coalition against airstrikes on Houthi rebels will have a deep impact on the relations between the two countries. On the other hand, Pakistan houses 20 percent of Shi’a population and any wrong decision at this time when Pakistan itself is rocked by violence and turbulence has the possibility of impinging upon the country’s future by provoking sectarian violence in the country. A Pakistani delegation led by Khwaja Asif, Pakistan’s Defence Minister went to Riyadh to assess the situation. Pakistan’s policy makers have sat down together in a joint Parliamentary Session and are currently contemplating on which decision to take. Different political parties have expressed divergent views on Pakistan’s supposed role in Yemen but they all have agreed that Pakistan should not be directly involved in the conflict. The main opposition parties, Pakistan People’s Party, Pakistan Tehreek-i-Insaf, Awami National Party, Muttahida Qaumi Movement and smaller parties like Awami Worker Party have outrightly opposed military intervention in the ongoing conflict. The religious political parties especially Jamaat-e-Islami and Jamiat-ullema-Islam have called for Pakistan’s role as a mediator and not as an interventionist. It should be noted that the Adviser on Foreign Affairs and National Security Sartaj Aziz has hinted at an emerging consensus in parliament against intervention in Yemen. Furthermore, media and civil society is staunchly opposing Pakistan’s role as an interventionist force. The safest policy option for Pakistan would be to play the role of a negotiator among all parties and avoid taking a part in the Saudi-led coalition carrying out attacks in Yemen. Pakistan’s interests are in playing the role of a facilitator and avoiding conflict with any of the involved parties to save itself from any future controversy. Violence and wars are never a solution. World’s history is full of evidence on how every war ended on a political solution. Pakistan, itself, being the victim of anarchy and violence for more than three decades, has enough experience of how a vulnerable neighbour can impinge upon a country’s security, and it therefore, needs to convey this sentiment to its Arab allies especially Saudi Arabia to solve these issue diplomatically. Yemen is a sovereign country and the world needs to let the people of Yemen decide on which direction to take. With the over-all volatile situation in the Middle-East, all parties involved need to let sanity prevail or else the situation will get worse and perhaps engulf the countries along with their monarchies, and there will be nothing to fight over. Ifrah Waqar is currently working as a Research Associate at the Centre for Pakistan and Gulf Studies. The views expressed in this report are of writers own and do not necessarily present the position of the Centre. 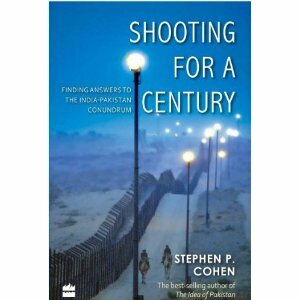 The book titled “Shooting for a Century: The India-Pakistan Conundrum” by Stephen P. Cohen makes a detailed study of the history of conflicts between Pakistan and India, their explanation, American interests and prospects in the region. The author has suggested that Pakistan-India rivalry is likely to continue for several more decades even a “century”, and full normalization between the two countries seems impossible. He further speculates that out of the two countries, Pakistan seems to be the possible contender which might disintegrate or fragment owing up to the on-going conflicts in the country, and the result might end up as a catastrophic event in the form of a fully-blown nuclear war between Pakistan and India. Contrary to the already existing literature available on Pakistan-India relations, Mr. Stephen Cohen has presented another narrative from the perspective of all stakeholders involved and has suggested possible scenarios of how the future might shape. He has at many places put up the rationale of the current status-quo continuing to exist between Pakistan and India; declaring it to be the best state of normalization that the countries can achieve. Mr. Cohen has succinctly narrated the historical background of Pakistan and India since 1947 and their positions vis-à-vis each other. He has also successfully shed light at the two schools of thought in both the countries, and how their views about the other country have shaped the foreign policies of the respective countries. The governments of both the countries have succumbed in one way or the other when these groups have built up domestic pressure and it has shown in the policy posture of Pakistan and India. The author has given a detailed account of the disputes and issues that exist between the two countries which include the Kashmir dispute, the water issue and the Siachen Glacier. He has also included the issues of nuclearisation of both countries and the issue of Islamic extremism pertaining to the topic of conflicts which exist between the two countries. The topic of contemporary conflicts which exist between the two countries is then discussed. Mr. Cohen has dismissed any acts of vivisecting Pakistan by India like the one that happened in 1971. He has said that acquiring of nuclear status by the two countries has put a full-stop to such acts, and the two countries cannot afford adventures like these as the stakes are too high now. Mr. Stephen Cohen has categorized the relation between Islamabad and New Delhi to be under the influence of “Westphalian issues” which has dominated the dialogue process between the two. These issues include sovereignty, terrorism, propaganda campaigns against each other and reluctance to hold negotiations. He has given six accounts of the Pakistan-India rivalry which include civilizational clash, state identity, the Kashmir dispute, power politics rivalry, enmity based on the psychological abnormalities of the other side, and a feeling of hostility and antagonism based towards each other created by the third or outside powers. He has termed the existing conflicts between Pakistan and India as intractable. The author has then given an account of the attempts made to normalize relations between the two countries. He has elaborated on the role of Track II diplomacy and has highlighted the unofficial attempts and the role of back-channels to initiate secret talks on sensitive issues like the nuclear programme to ease the global fears of a possible nuclear war occurring between the two. He has also shed light on the role of third parties who have intervened in the matters of the two countries and have played their part over the years. American interests and policies are discussed by the author in detail. He has said that the United States perhaps cannot do much about the identity issues between the two, but it can definitely play its role as far as trade and economic cooperation are concerned. He, however, has said the U.S. can perhaps play its role for cooperation on strategic issues, but only in Afghanistan and not in solving the sensitive Kashmir dispute. Mr Cohen has discussed the recent U.S. Policies towards India and Pakistan which include a Comprehensive South Asia Policy, the necessity for the U.S. to recognize the importance to ensure normalization of relationship between the two nuclear states in South Asia without being in the colonial past, or be too deeply involved in the process of normalization. He has advised the U.S. policy-makers to do something to normalize the relations between Islamabad and New Delhi, but not to do harm. It is important that the pace and terms of cooperation are set and pursued by the two instead of the United States. Pakistan and India’s relations have always existed in a paradox. The two countries have been a victim of colonialism and have been historically hostile towards each other. International events such as the Cold War politics have had deep impact on the psyche of these two countries and the two perceive each other as rivals. Mr. Cohen has, in detail, documented the history between Pakistan and India and the bottom-line of his historical documentation stands at the point that the rivalry between the two countries will continue to exist, and perhaps the best stage of normalization between the two is if the status-quo continues to prevail. He has advised the Americans to have a long-term policy in South Asia and has always suggested that China should be involved in the dialogue process between the two countries. Furthermore, he has given his suggestion that the Line of Control in Kashmir should be changed into a permanent border. The author has also advised the U.S. to extend cooperation between Islamabad and India on the issue of Afghanistan, but has neglected to mention the insecurities and mistrust that exist amid the policy-makers in Islamabad towards the role of India in Afghanistan. The book aims to explain the existing rivalry between the two countries, but ends up in giving partisan recommendations to solve the existing disputes and crises. Furthermore, Mr. Cohen has focused on Pakistan’s internal fissure points and has predicted that, sooner or later, the country is going to disintegrate, but has not mentioned similar problems faced by India like the Maoist insurgency. A few statements made by the author are untrue. Like, he has said Allama Iqbal studied at Aligarh University and that the Dawoodi Bohras are “persecuted violently” in Pakistan. These assertions are far from the truth. All in all, Mr Stephen Cohen’s book is an interesting narrative of the Pakistan-India history. It is an informative read and should be read by the students of history and international relations as that would be beneficial for understanding the outstanding issues and disputes between the two countries.